There are many people contributing to the field of respiratory therapy. In my journey to learn more about this field, I have reached out to few individuals to discover more about their experiences and the types of activities there are currently involved in. 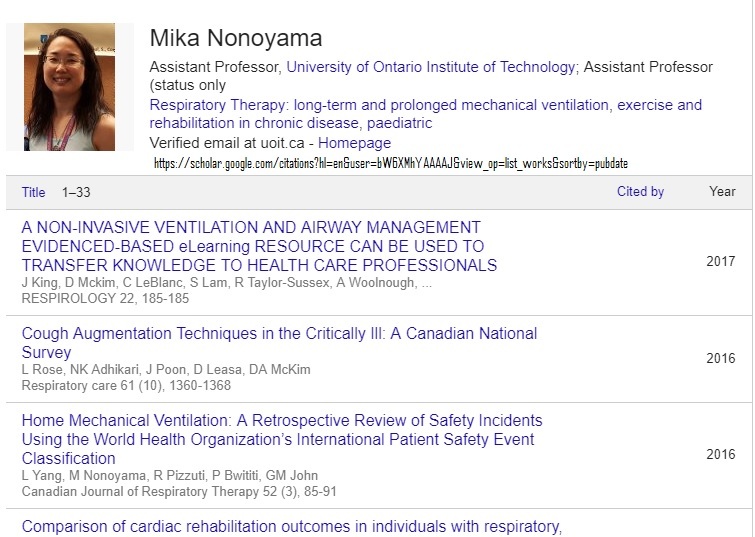 Today’s post is about Dr. Mika Nonoyama. Question 1: What attracted you to the research side of respiratory therapy? A few reasons. I loved the idea of coming up with a question and going through the process of answering it. Especially once all the data has been collected and it sits in front of you – it’s almost like an exciting mystery where the results could go any which way despite the hypotheses. The other main reason is because of my mentors, in particular my PhD supervisor Dina Brooks who is a fantastic leader and doing such amazing research. Question 2. What does a typical day look like for you? In theory my job is 40% research, 40% teaching and 20% service (volunteering). But depending on the time of year it will change…every day is different. During the teaching term much of my time is devoted to the preparation and ongoing upkeep of the courses (at UOIT). I spend once a week at SickKids doing research with the front-line RTs and collaboratively with other researchers. I also do other research that brings me into the community setting. I have many students (undergraduate, graduate and RT) who help with the initial parts of the research projects while I oversee the processes. My service involves volunteering at various places like the Lung Association and within my University. I love this aspect of my job also because I am able to network and learn about the work these organizations do. I have to mention my day also involves being a wife and a mother of school aged children! Question 3. Who do you collaborate with on daily basis? My three research themes are 1) paediatric respiratory therapy; 2) long-term mechanical ventilation; and 3) rehabilitation and chronic respiratory disease. For each of these themes I have different collaborations. The first are my collaborations with SickKids, but I also have connections with folks at CHEO. I collaborate with a large group across the country of health professionals for long-term mechanical ventilation – we call ourselves CANuVENT. My main mentor there is Louise Rose. For the rehab and chronic lung disease I also have various contacts but much of my collaboration is with Dina Brooks. Question 4. What are some of the sources of gratification/satisfaction and challenge working in this area? Question 5. What were some areas/knowledge/skill sets that you had to work on to improve in this role? There is the usual education but more importantly is the desire to learn and do things outside the box. Trying something that interest you and makes you somewhat uncomfortable can lead to wonderful things. I also believe that volunteering your time is essential. I found my success came once I figured out what interested me and what I wanted to do (seems simplistic I know). Once I had that vision I put things in place to make it happen. Having great mentorship to help along the way is key too. Question 6. Any interesting projects you are working on right now? One of the most interesting (and challenging) is trying to streamline various respiratory therapies in the paediatric ICU at SickKids. As you know there are many aspects to RT – intubation, weaning, extubation and everything in between. We are working step-by-step on this, extubation readiness being the first. It’s interesting because the research questions come from patient care, involve the care practitioners and are applied back to patient care. Since I don’t practice anymore it’s wonderful to be a part of the practice side of things. Question 7. Where do you see the future of Respiratory Therapy? I do hope RT becomes a degree-entry-to-practice. Since most students have a degree already it seems to make sense. It would also help get RTs more within the University system so they are able to interact with the peers they would practice with e.g. nursing, PT, OT, MDs. It would be great also if many RTs would seek graduate degrees and step into the primary investigator role within their institutions. Question 8 – Any recommendations/thoughts/suggestions for students and RRT who are interested in getting involved in the research side? What are the steps involved? Though generic my answer for question 5 really is the advice I would give. Figure out what area you would want to research and find who is involved. Get in touch with them to see if you can start the collaboration. I am always happy to hear from anyone to chat about things also. Question 9- Any final thoughts? I do love what I do and feel very lucky I am able to do it. Thank you Mika for sharing your experience, perspective, and giving us a better understanding of the research side of the respiratory therapy field!